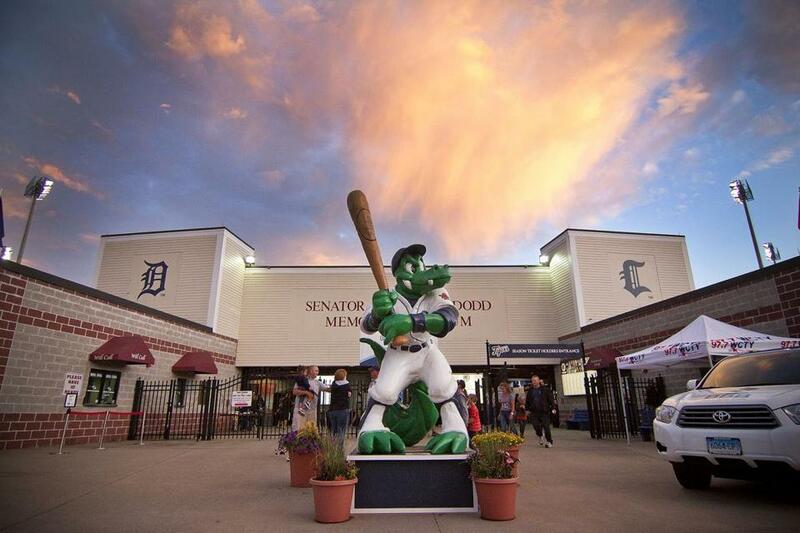 Norwich’s Senator Thomas J. Dodd Memorial Stadium is home to the minor-league Connecticut Tigers. Settled along the Thames River, Norwich, dubbed the Rose of New England, was once a thriving shipping center and prosperous Connecticut mill town. But the bloom was off the rose by the late 20th century, when the town suffered economic setbacks. Today, it’s making a comeback led by local citizens and revitalization programs. Beautiful historic homes are being restored; leafy parks are home to an array of festivals and events; and there’s a growing arts community. Most visitors still come seeking alternative lodging from the nearby casino resorts (Mohegan Sun and Foxwoods Resort Casino are less than 15 minutes away), or to visit the well-known Spa at Norwich Inn, but this rebounding town is worth a closer look. 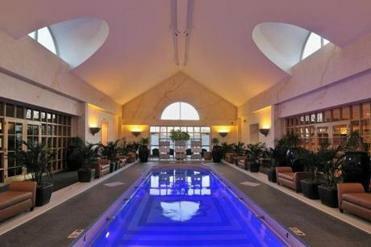 The Spa at Norwich Inn is set on 42 acres with an indoor pool, among other amenities. The classiest place to stay in town is the highly touted Spa at Norwich Inn (607 West Thames St., 860-425-3500, www.thespaatnorwichinn.com, $150-$325). The historic Georgian Colonial inn is set on 42 acres, surrounded by formal gardens and sweeping lawns. The 100 rooms, suites, and separate condo-style villas feature private baths and traditional country décor, and room rates include complimentary guided morning walks, daily meditation sessions, afternoon tea and scones, and evening wine tastings. A visit to the on-site spa is the real draw, where you’ll find 37 treatment rooms, an indoor pool, relaxation areas, and an array of therapies from body scrubs, massages and facials to Reiki sessions and tarot-card readings. If you’re looking for something more standard and typically less expensive, head to the Courtyard by Marriott (181 West Town St., 860-886-2600, www.marriott.com/hotels/travel/goncy-courtyard-norwich, rates starting at $179). Rooms are bare bones and basic, but clean, and the lobby just got a sleek makeover providing a pleasant place to read the paper or take advantage of the free Wi-Fi. If you’re craving homey Italian cuisine, head to Bella Fiore (543 West Thames St., 860-887-9030, www.bellafiorerestaurant.com, $13.95-$29.95). The low-lit dining room features old-world murals, comfy booths, and an indoor waterfall in a subdued atmostphere. Toughest part is choosing what to order; the menu is huge, featuring traditional pasta, chicken, veal, lamb, steaks, and fish dishes. Calories be damned: Try the classic fettucine alfredo, which gets top marks for its creamy, garlicky sauce. We also enjoyed the perfectly seared grilled lamb chops topped with Gorgonzola cheese and port wine sauce. The longstanding Olde Tymes (360 West Main St., 860-887-6865, www.oldetymes.com, $7.50-$16.99) will satisfy your craving for home-cooked, comfort food, like made-from-scratch meatloaf, slow-roasted pork, grilled liver and onions, Southern fried chicken, and roast turkey with all the trimmings. And if you’re craving red meat, you can’t beat the prime rib roast. Locals love Jack’s Brick Oven (493 West Main St., 860-887-1100, www.jacksbrickoven.com, pizzas $10.95-$19.95). There are plenty of specialty pizzas like the chicken cacciatore and the steak-bomb Valentina with steak, peppers, onions, and cheese, but simple may be the way to go; after all, it’s hard to improve on the Sicilian, with fresh plum tomatoes, garlic, basil, and mozzarella cheese. Mahzu Sushi Bar & Restaurant (624 West Main St., 860-889-8288, www.mahzusushiinnorwichct.com, pieces $1.50-$10.95, sushi entrees with soup and salad $10.95-$22.95) is a surprise. At first glance, it’s not promising (it’s stuck next to a grocery store), but the sushi, sashimi, and rolls are fresh, and the prices are decent. Slater Memorial Museum (108 Crescent St., 860-887-2506, www.slatermuseum.org, adults $3, students $2, under age 12 free), on the campus of Norwich Free Academy, is worth a visit. The small but impressive art museum has a collection of 150 plaster casts of classical and Renaissance sculpture, and art and artifacts from around the world. For the best look at the collection, take a free docent-led tour. It won’t be long before minor league baseball season begins, and there are few better places to catch a game than Senator Thomas J. Dodd Memorial Stadium (14 Stott Ave., 806-887-7962, www.milb.com, ticket prices vary), home of the Connecticut Tigers of the New York-Penn League, a Detroit Tigers farm team. Its clean, family-friendly atmosphere wins raves from fans across New England. Norwich Arts Center (60-64 Broadway, 860-887-2789, www.norwicharts.org) showcases work from local and regional artists and hosts concerts, plays, and readings in the intimate Donald L. Oat Theater. Across the street is Encore Justified (102 Main St., 860-908-2497, www.facebook.com/encorejustified), a cool store featuring an inspired and creative collection of repurposed antiques and artifacts. Take a walk on the Heritage Riverfront Trail, along the waterfront and up the river to the Uncas Leap Waterfall, where the Mohegan and the Narragansett tribes battled. Mohegan Park (Mohegan Park Road, 860-823-3796, www.norwichct.org) is a lovely place to hang out, with fountains, gardens, and a network of trails through forests and along a couple of ponds. Nearby is the Mashantucket Pequot Museum & Research Center (110 Pequot Trail, Mashantucket; 860-396-6800; www.pequotmuseum.org; $20.) The highlight is a walk-through, 16th-century Pequot Village populated with 51 figures cast from contemporary Native Americans. Through May 17 the center is hosting an interactive exhibit, “Backyard Monsters: The World of Insects,” featuring robotic insects up to 96 times their actual size including a hairy, 11-foot-high tarantula. Harp & Dragon is a sometimes raucous Main Street hangout with some 30 beers on tap. Spirit of Broadway (24 Chestnut St., 860-886-2378, www.spirit ofbroadway.org), a 74-seat black-box theater, shows first-run musicals year-round and is known for its innovative lineup. 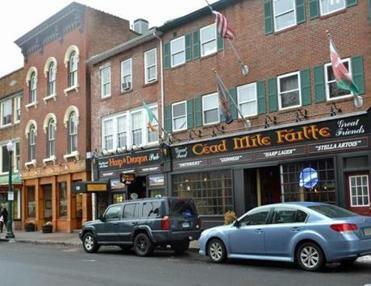 Hoist a pint at the Harp and Dragon (130 Main St., 860-885-0147), a local, often raucous, hangout with some 30 beers on tap. Billy Wilson’s Ageing Still (57 Broadway, 860-887-8733, www.facebook.com/Billy.Wilsons.Ageing.Still) has a loyal local following that comes for the beer and the camaraderie.